I’m not sure why people don’t usually think to put fruit in a quesadilla. It’s truly a fantastic idea! The combination of the fresh fruit slightly warmed with melting cheese is wonderful. Basil leaves are one of my favorite additions — it’s not necessary to chop them for something like this. Adding a whole leaf adds interest to a recipe, and provides a very flavorful, aromatic bite! This recipe can also be made with papaya. And if basil’s not your cup of tea, spinach leaves would be nice, too. 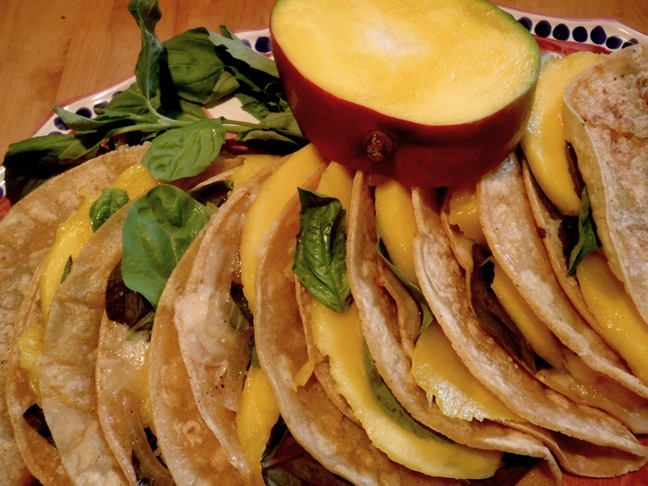 Kids and adults alike enjoy a good quesadilla — and who wouldn’t love one with fruit? It’s a quick to make, healthy, and a treat! Coat the bottom of a large saute pan with olive oil. Over medium-high heat, stirring almost constantly, cook the onions until nicely browned, about 7 minutes. Season them to taste with salt and pepper, and set aside. Cut each mango into thin slices, about 1/4″ thick. Please note that mangoes have a big, flat pit, that runs the length of the fruit. Slice on either side, and remove the skin with a small knife, after you’ve made the thin slices. Set aside. In the same pan, over medium heat, add as many tortillas that will easily fit. (If the pan is dry, add a bit more oil.) Put about 1/4 cup of cheese on each tortilla to evenly coat each one. Once the cheese is almost melted, gently press several basil leaves on top. Then on one half, add a couple of the mango slices and fold over the other half. Serve with salsa of your choice!